Easy Video Dynamo is the Fastest and Easiest Video Marketing System Virtually Anyone Can Use Right Now! Perfect for PowerPoint King Tut owners. Your video creation worries are finally over because the EZ Video Dynamo system will take you from being an absolute noob to a video making pro in just a few minutes. And if you're already a pro, you'll save time, money, blood, sweat and tears. 6 Unique PowerPoint marketing templates - These templates were created to give you a powerful combination of explainer-style videos to promote products, businesses and services, as well as to use as "squeeze" videos to help you build your (and your clients') email lists. This is Al - Here is a high-quality animated presentation. It actually uses videos (of Albert) as the background. You only need to make a couple of very minor changes in PowerPoint to customize it for a plethora of uses and topics. Meet Rick Stickman - This template can be used for either direct contact or as a squeeze video. Just delete a couple of slides for either. Helping Hand - Another easy to modify template that can be used for direct contact or squeeze. Simply delete either of the final slides, depending on your preference. Lines - Just a few quick and easy modifications and you'll have a great "flowing" presentation video. Vicky Stickman - Yet another PowerPoint template that's super-easy to customize for a variety of uses. The "AJ" Squeeze Page - This template is based on Andy Jenkin's formula for creating squeeze pages that get results. Just follow the step-by-step instructions included below every slide to create powerful squeeze videos sure to improve your opt-ins. Meet the Video Marketer's 'Secret Weapon'! Creates vibrant and effective video "squeeze" pages with just a few clicks. 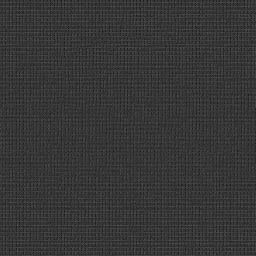 Select from over 350 different skins in 3 popular sizes. Just click to enable or disable advanced features such as "auto play" and "show related videos". HTML pages means that after you download your Video Squeeze Page Dyno 5000 pages you can spice them up any way you want using any basic HTML editor you desire. No fooling with messy plugins or having to use the same WordPress template for every squeeze page. Instead, you are in total control! Plus, HTML pages are much more server friendly than WordPress, so they load FAST. Your hosting service will love you! 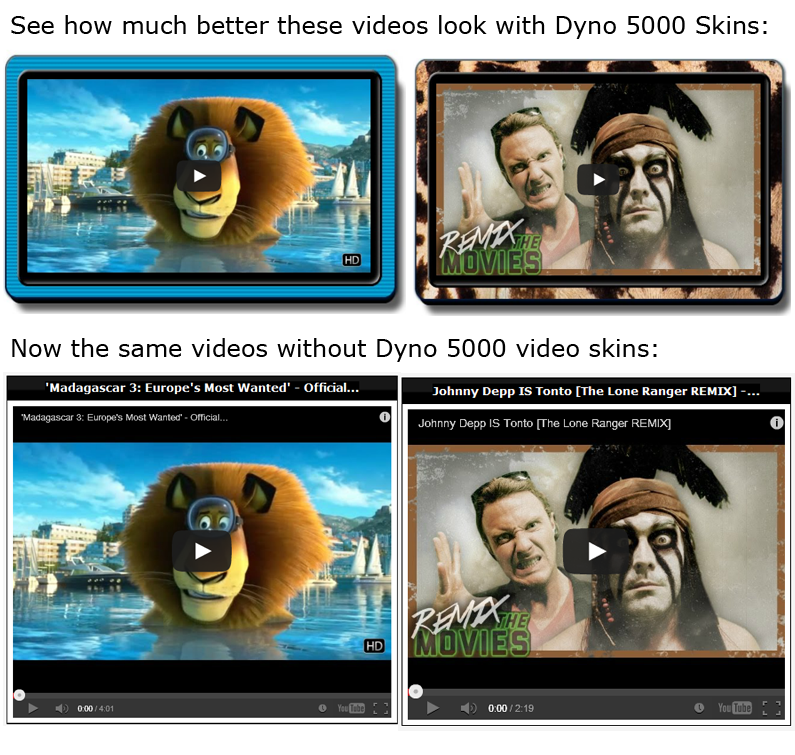 Use the Dyno 5000 with any and all YouTube Videos! If the video is on YouTube, you can use our Dyno 5000 to really jazz up how the videos look when you embed them on your own pages. Have you bought other PowerPoint video template WSOs? Then use the Dyno 5000 to make them really come alive too. This is a collection of the very best resources for creating your own "explainer" videos using PowerPoint and other programs. I've spent countless hours, days, weeks and even months scouring the Net for the best of the best. The Classified Tools File is an essential guide for those of you that want to take your video creation skills using PowerPoint to the next level. ✓ Discover an easy and free way to use Powerpoint with this great resource to create your own custom animated "intros" and "outros" that will rival those made with fancy software like Adobe's After Effects, but it's free and much easier. ✓ The very best places to get free and cheap music for your sound tracks. Battling the video making blues? Bonus Character Kit Makes Creating Your Own Explainer Videos Easy and Effectively! You're also getting a cool and potent package of characters you can use in your own videos, and other projects too! These stickmen were specially made to express a wide assortment of emotions and actions to really set the mood for all your video stories. Just add them to a little text in PowerPoint and you have the power to make videos that look like an expert made them. The video above only shows the men. There's also 100 women characters. How I Make Custom Characters for Videos and You Can Too! 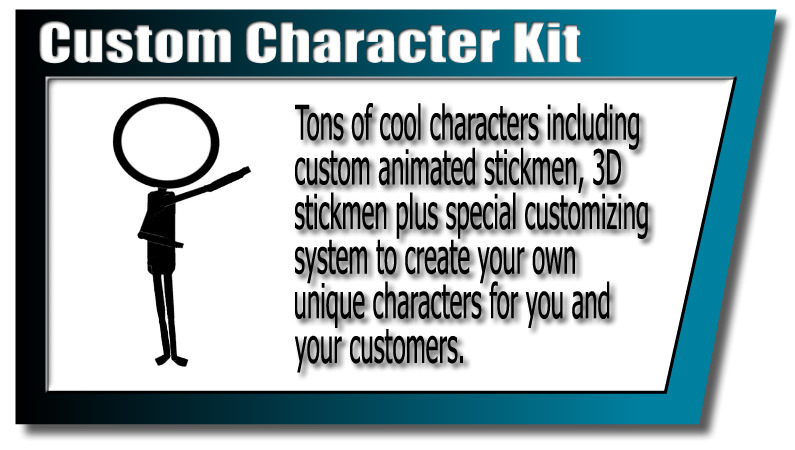 Even if you already have the 3D stickmen (and women) from the collection above, my Custom Hat Trick Collection will let you transform your 3D stickmen into thousands of unique characters, perfect for all your projects. I spent hours and hours searching for the best public domain clipart for this project, but you don't have to. I then added the collection to some Powerpoint slides to give you easy access to them when making videos from Powerpoint. This really saves you time and hassles and lets you be much more productive. Note: These "hat tricks" don't work well with the animated stickmen, as the animated characters move making it hard for the accessories to sync with them. Make Even More Money! Use These Characters and Custom Hat Trick Accessories in All Your Clients' Projects Too! What makes the Custom Character Kit so unique and powerful is that each collection comes with very liberal usage rights that allows you to use them in projects you can sell to clients and templates you create. It's very difficult to find any type of media that you can transfer usage rights to others, without having to fork over tons of cash for an "extended license", if they even offer one. And there's plenty of other WSOs selling you images they probably don't have the legal authority to give you. Animated stickmen collection. 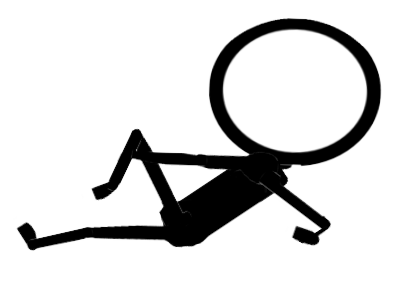 I drew the stickman and animated it myself. 3D stick figure collection - Created by another Warrior Forum member, and includes resale rights that I can pass on to you. Custom Hat Trick collection - Gathered by me from two public domain clipart web sites. Because of the licenses associated with each package, you have the potential to create and use thousands of unique characters for yourself and your customers LEGALLY. And at a price that's far less than a typical extended license for a single image. - Windows PC computer. Almost all of the resources will work on Mac, but you may run into issues with the PowerPoint templates on a Mac. - You need Microsoft PowerPoint 2010 or 2013 for the explainer/squeeze videos. You can use the Dyno 5000 video squeeze page maker and Custom Character Kit with a vast assortment of programs and applications. - To use Video Squeeze page Dyno 5000 you need a web browser set to allow cookies. 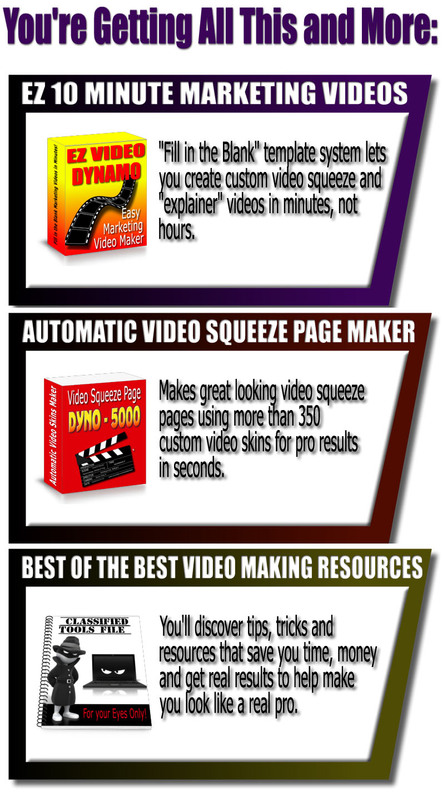 - Video Squeeze Page Dyno 5000 requires that the videos be hosted on Youtube. - HTML and/or web design skills if you want to modify the Dyno 5000 squeeze pages. - Basic computer skills, such as being able to download and upzip folders and upload to your website. - Music/Soundtracks used in the video examples is not included. But the Classified Tools File shows you where to get the highest quality background music for free or very cheap for your own use. [NO] You may not redistribute any of the files included in this package in any way. This includes the Powerpoint templates as well as any reports, character images, etc. 6 unique and easy to customize PowerPoint templates to make explainer and squeeze videos. Access to the Dyno 5000 semi-auto squeeze page maker with over 350 skin options. 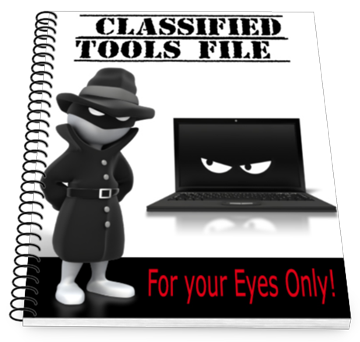 The Classified Tools File filled with the best free or cheap, easy to use video-making resources. The Character Collection, including animated stickmen, 3D stickmen and my "hat trick" collection. Price will raise to $22. Then ??? Everything included! You get it all!